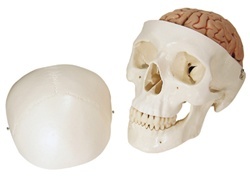 This classic-skull with brain model, 8-part by 3BScientific is a high-quality original cast which is made of a hard-unbreakable plastic material. Its skull cap is can be disassembled from the base of the skull and mandible to show and give a better view of the replica of the brain. The classic skull with brain model is an excellent choice for a visual aid for basic anatomical study which is ideal for both high school and anatomy students. FUNCTIONAL- This model is very functional because the skull and the base of the skull mandible is can be disassembled to give you a better and greater view of the midsagittal divided brain.